Why STEM? The world is connected, by technology, by social responsibility, by a global economy, by our desire to learn and grow. Why STEM? Because we can't imagine a world without it. The STEM Academy is a program for sixth through twelfth graders who are interested in science, technology, engineering, and mathematics. At the middle school level, STEM is a college-preparatory program located at Roy J. Smith Middle School. 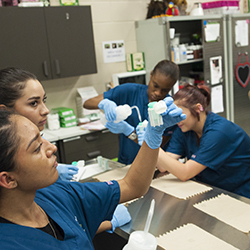 At the high school level, STEM offers multiple degreed and non-degreed pathways offered at Killeen, Ellison, Harker Heights, and Shoemaker High Schools. The goal of the STEM Academy is to support a diverse learning community based on common interests. The STEM Academy supports students in developing a vision of future academic and career possibilities and enables students to translate those visions into the realities of college graduation, informed citizenship, and international leadership. All young people should be prepared to think deeply, think critically, and solve problems. "In a world that's becoming increasingly complex, where success is driven not only by what you know, but by what you can do with what you know, it's more important than ever to be equipped with the knowledge and skills to solve tough problems, gather and evaluate evidence, and make sense of information" www.ed.gov/stem These are the types of skills that students learning by studying science, technology, engineering, and math-STEM! 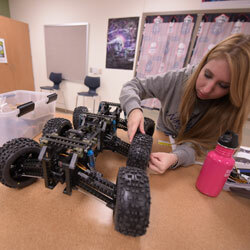 The STEM Academy employs a project based learning (PBL) approach. The PBL model supports students in learning the content of their courses while learning the "soft skills" needed in college, career, and life. Students learn to take initiative and responsibility. They work in teams to solve real world problems, while developing communication and self-management skills. PBL empowers students to be part of a global community by collaborating with experts in various fields of STEM and sharing their learning with audiences around the world. Students in the STEM Academy will use technology as a tool to enhance learning. The goal of the STEM Academy is full digital integration in most classes. Just as adults use computers and other technology to do their jobs, students will use technology to support and demonstrate their learning. STEM education opens the world for students. Take advantage of this opportunity today by completing the application for admission to the STEM academy. All students in the KISD attendance zone who are in grades 6-12 are eligible to apply. Students who submit a completed application will be included in a lottery selection process. This lottery will determine which students will be offered enrollment in the STEM Academy. Students not selected will be placed on a waiting list. Looking to make a lasting difference in their own neighborhood, seventh- and eighth-graders launched a new unit tied to civic involvement. 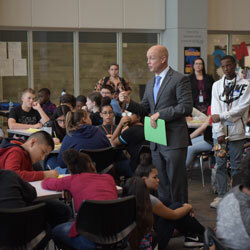 Smith Middle School STEM Academy students began their newest large project with a conference that attracted a dozen local leaders from business, military, education and service sectors in the community. The sheer numbers and the developing variety are impressive, but there’s far more to the Killeen ISD Career Center than facts and figures. The specialized high school on Stagecoach Road in Killeen is in its seventh year and it is larger and more diversified than ever. Great as that is, there’s more to the story. 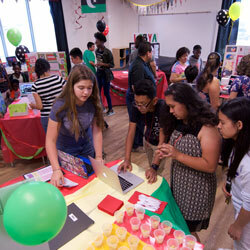 Smith Middle School STEM Academy seventh-graders summoned the world to their school to culminate a major project analyzing global public health. The academy, in its first year at the new middle school in south Killeen, uses Project-Based Learning which takes a multi-disciplinary approach with students collaborating in groups, using technology and including the community. 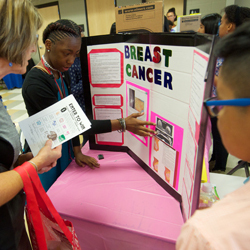 Seventh-graders sought out complex facts about specific kinds of cancer, interviewed experts and presented their findings in a public health fair. Killeen families will save thousands of dollars on college tuition costs after the Killeen ISD school board’s approval Tuesday night of a plan to offer science, technology, engineering and math dual enrollment academy courses for all KISD high schools.